Kids and kids at heart will be rolling their way through Marymoor Park on October 8th during Seattle’s first Stroller Derby 5k run. Before hitting the sidewalks this summer, consider safety first; you shouldn't begin running with your baby until he or she is at least six months old. Here are some other tips on jogging with a stroller to prepare you for the day of family fun. When running downhill, don’t let the stroller pull you. Fitness and family blogger Nicole Crawford advises to refrain from extending your arms while going downhill. She says if you allow your arms to extend outward and lose control, you’ll have no leeway if the stroller gains too much momentum. “It might feel like you’re actually pulling the stroller against gravity—that’s because you are,” says Crawford. Flex those “guns” and keep the stroller close. Putting the front wheel in lock mode can also assist with steep drops. Crawford finds many moms and dads guilty of “the protruding booty.” This happens when you lean your upper body weight into the handlebar. To check in and prevent this problem, remove one hand from the handle and correct your form. Try switching up your arms when they’re feeling fatigued instead of putting stress on your back. Elite coach Brad Hudson of Boulder, Colorado trains several jog-strolling runners and advises new parents to not be disappointed by your pace. You’re most likely pushing at least 30 extra pounds so cut yourself some slack! Chances are you won’t run quite as fast as you normally do without the stroller, but you may be surprised at how fast you’ll actually go. To begin, work in moderate hills without the stroller for an added challenge once or twice a week and use the stroller on other days across flat terrain at a slow pace to aid in recovery. No parent wants to turn around a mile in because of rumbling tummies from the peanut gallery. But if you do pack snacks, make sure they're large enough that they won't cause choking. Toys or books can keep the little one from crying of boredom by the finish line. Sunscreen and bottled water will help beat the heat, and don’t forget a backup diaper just in case! 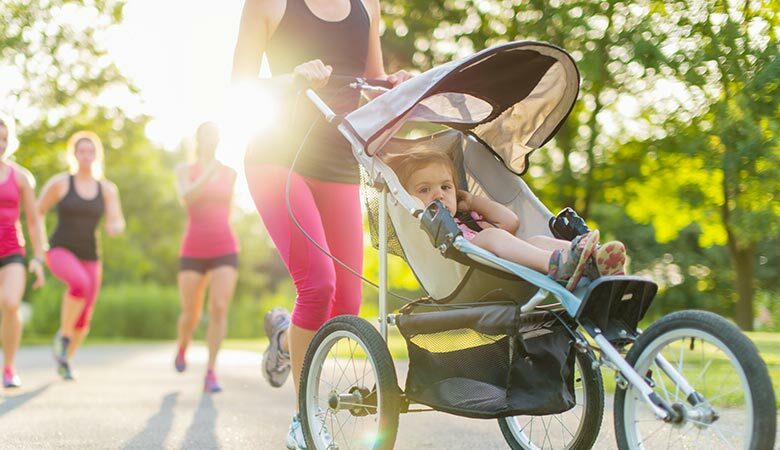 One of the best ways to ensure successful and safe jogging is to pick the best stroller for you and baby. According to Baby Gear Lab, the 2017 top five best strollers for jogging are: the Thule Urban Glide ($400), BOB Revolution Flex ($500), Thule Glide ($375), Burley Solstice ($400), BOB Ironman ($420). Get tickets now for Stroller Derby Seattle at Marymoor on October 8, 2017.